As anyone who has seen the customary travel snaps knows, some of the best places to visit in India are its famous palaces. These beautiful structures blending the country’s colourful culture with its colonial past are a major drawcard of India travel, and there are a few epic pieces of architecture that you won’t want to miss from your list. Some even double as luxe places to stay, so that you can sleep like a royal on your trip to India. Joining a tour is also a great way of seeing more than one of these top things to do in India. The capital of Rajasthan, also known as the pink city, Jaipur is teeming with extravagant architecture to explore. At the heart of its heady mix of attractions is the City Palace, a majestic network of buildings and gardens where time has stood still. The former royal family still calls this complex home, with select areas open to public admission, but the extensive grounds outside of the private Chandra Mahal palace have more than enough to keep you busy. Art exhibits, displays of royal costumes and armoury, and four beautifully tiled gates representing the seasons of the year are all found here. Another of Jaipur’s famous palaces is Hawa Mahal, recognisable for its red and pink hues and honeycomb-shaped windows. Udaipur is one of the most romantic destinations in India and the Taj Lake Palace – floating on the tranquil waters of Lake Pichola – is one of the city’s dreamiest hotels. 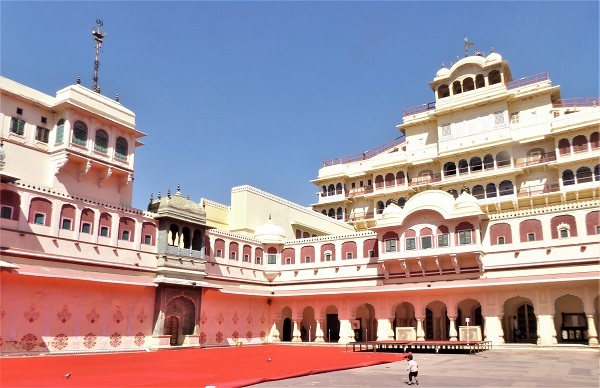 Built in the 18th century as a retreat for the Mewar dynasty, the palace was converted for holidaymakers in the 1960s. 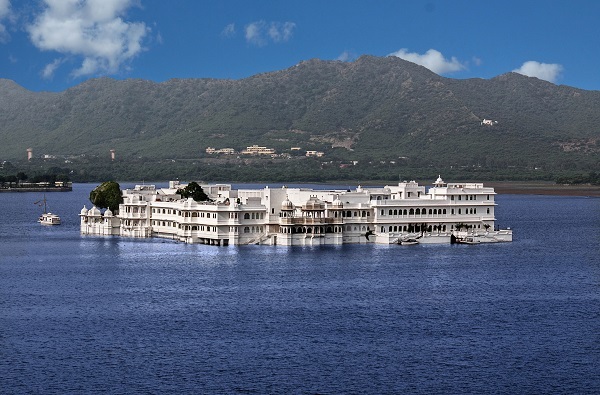 Featuring water taxis to and from the pier, a swimming pool with archways and views that in the lake, a rooftop with rotundas to sit under and watch the sun rise or set, four restaurants and richly decorated rooms with views (including outlooks to the must-visit Udaipur City Palace on the shore), a stay at Taj Lake Palace promises an unforgettable experience. Only guests of the hotel are allowed in the palace; perhaps even more reason to book yourself in for an indulgent night? If you can’t get to the Taj Lake Palace, another of Udaipur’s majestic royal residences to check out is its City Palace. The capital of India is exhilarating, chaotic, full of historical beauty, and unlike anywhere else. 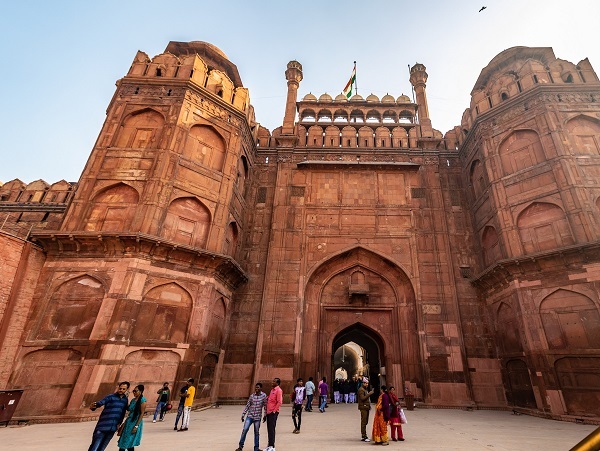 As well as eating from the chaat carts, bartering at the bazaars, and visiting the vibrant religious sites, you’ll want to tick Old Delhi’s Red Fort off your list. Constructed in the 17th century by Emperor Shah Jahan, the imposing 18-metre tall wall of this rusty red fortress conceals magnificent colonnaded interiors that will leave you in awe. You can also uncover the chequered history of the site at your own pace with an audio tour. At a size that is rumoured to be four times that of Buckingham Palace in London, ‘grand’ is certainly a word apt for describing Laxmi Vilas Palace. 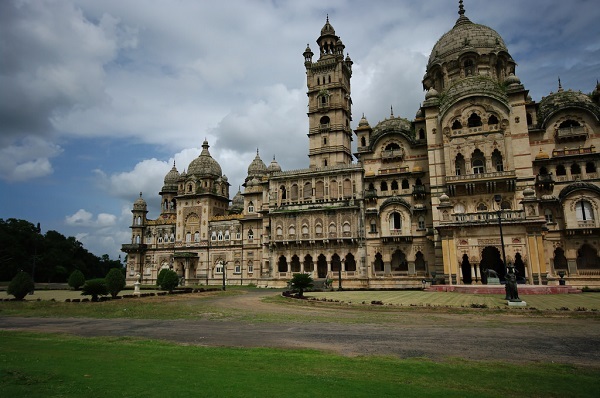 Occupying a compound of more than 700 acres, the palace was built in 1890 by Maharaja Sayajirao Gaekwad III, and it remains the residence of the Baroda royal family. A golf course on the grounds – originally established for the maharaja’s British guests – is open to the public. There is also a museum housing portraits, various works and exhibits. Hyderabad has a regal history that makes it a top place for palace sighting in India. 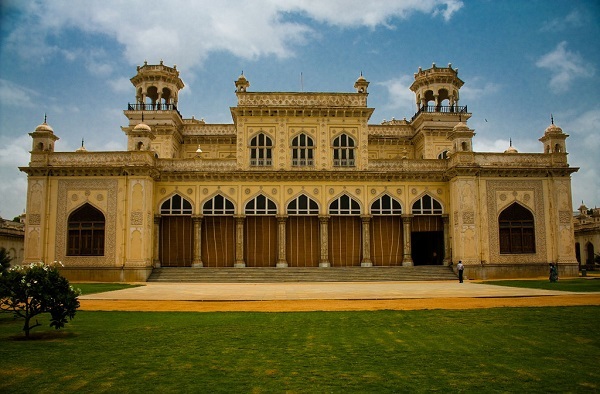 The Old City houses some particularly impressive architecture, and it’s here that the lavish Chowmahalla Palace lies. The grounds feature several elaborate buildings and courtyards where nizams, the past rulers of the region, once lived and gathered. One of the most stunning spaces within this palace’s walls is the Durbar Hall, where 19 glittering, Belgian-crystal chandeliers set the scene for fabulous ceremonies. If you’re a lover of classic cars, then you’ll also get a kick out of the rare collection on show in the southernmost courtyard. North-east of Jaipur is the sandstone spectacle of Amber Fort (or Amer Fort), with its dusty pink, orange and yellow hues set against the mountains and mirrored in the Maota Lake below. You could easily get lost navigating the courtyards, stairways and alleys of this massive palace complex, but as you take in the marble panels, painted archways and decorative metalwork, you’re unlikely to mind. Four courtyards, various halls and a small temple tell the stories of the maharajas that once called this compound home. 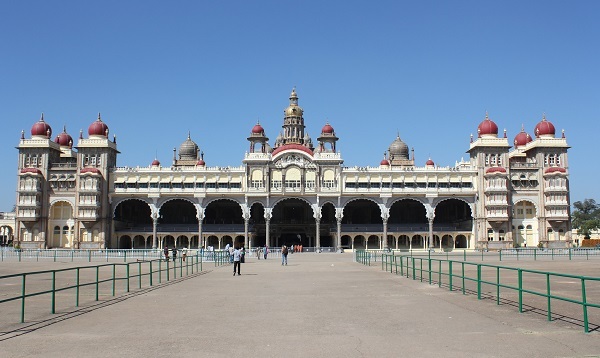 The technicolour interiors of Mysuru Palace make it the second-most popular landmark in India after the Taj Mahal. Stained-glass features, lavishly painted panels, detailed wood carvings and fabulous mosaics will greet you in this grandiose building, with a dizzying array of embellishments to draw your attention in every direction. Learn about life during the Raj period via the extravagant displays, sculptures and artefacts throughout the space. On Sundays from 7pm to 8pm, 100,000 lights illuminate the structure against the night sky. 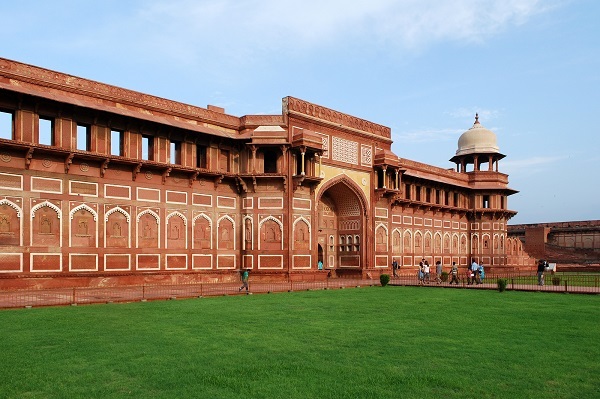 Jahangiri Mahal sits within the walls of the Agra Fort and is arguably the fort’s most notable site. It was built by Mughal Emperor Akbar as a zenana, a palace for the use of women of the royal household. However the palace’s most famous resident was Akbar’s daughter-in-law, Nur Jahan. The architecture showcases a medley of Hindu and Islamic styles, and visitors with a keen eye for design will want to get up-close to the sandstone to admire the intricate carvings. Be on the lookout for the Hauz-i-Jahangiri, a behemoth bathing basin that was carved from a single stone – and the artefact from which the palace gets its name. Move away from the cluster of palaces in Rajasthan to a 17th-century residence located in Madurai, in India’s south. 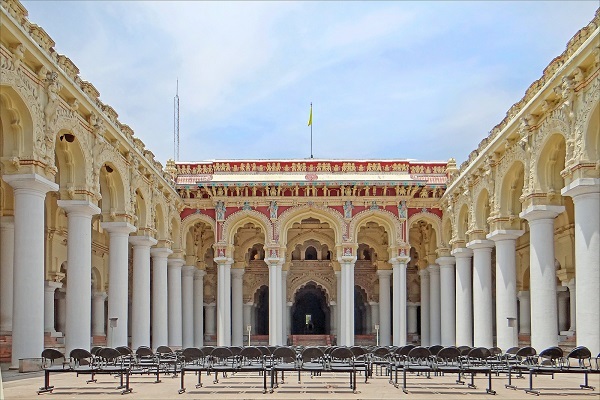 The palace, commissioned by King Thirumalai Nayak in 1636, has undergone much significant change and alteration since its original construction. Some of the buildings have been destroyed, and the King’s grandson removed some of its jewels and woodcarvings to fit out his own palace. A partial restoration was carried out by Lord Napier, Governor of Madras, in 1866 to 1872. The palace’s central courtyard is its most recognisable feature, easily identifiable thanks to its surrounding ring of pillars. 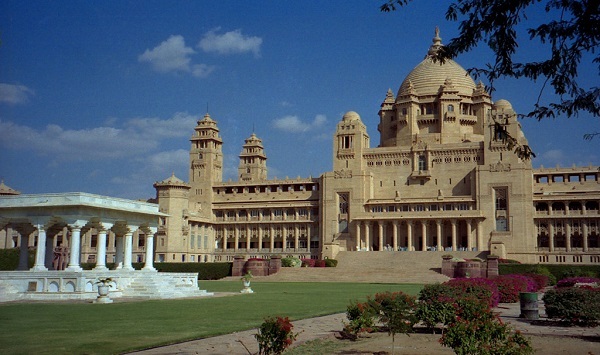 The magnificence of Umaid Bhawan Palace, located just outside of Jodphur, isn’t done justice by photos. It is one of the world’s largest private residences – yes, a section of the palace is still occupied by the original owner’s descendants – and another area is operated as a luxury hotel. The palace is relatively new (only completed in 1943) and was built in order to provide drought-stricken farmers in the area with employment. Inside, wide-eyed visitors can expect 347 rooms and architecture that straddles the design line between Indian style and western technology. 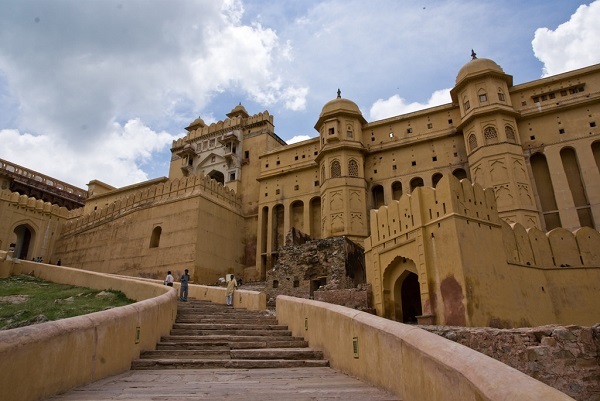 Take in one (or more) of the palaces above with an India tour with Webjet Exclusives. Find trip itineraries where visits to some of these royal piles are included, as well as flights and accommodation.